I grew up in Cleveland, but we still had “access” to Cincinnati Chili via Skyline. When I was younger, I didn’t care for the chili and would get buttered spaghetti when we went although I really did like that, their greek salad, and the oyster crackers. 😉 Later, I evolved enough to order a 3-way (spaghetti, chili, and a big lucious mound of cheese), but I still ask for the chili on the side, because it is a very strong flavor, so I like it in smaller quantities then what they give you. However, I decided I wanted to try a homemade version, and this ended up very well and fairly authentic tasting. One thing that I would recommend is to make sure you use regular paprika and not smoked. I didn’t think it would have a huge impact (it was all we had on hand), but I realize I’m just not the world’s biggest smoked paprika fan! Brown ground beef in olive oil, then add water, spices and tomato paste. Simmer for 2 hours, stirring occasionally and replacing water as needed. Add chocolate and continue simmering for 1 hour, stirring occasionally and replacing water as needed. Serve over pasta and top with cheese, beans, and/or onions depending on your preferences! While I enjoyed this one, Corrie thought it was just okay. Although it’s not complicated, there were a number of components between the salsa, sauce, and burgers, so I don’t think this one’s becoming a go-to meal anytime soon. Nevertheless, I think it might be a good starting place for a burger thought…maybe a teriyaki burger glazed with store-bought teriyaki sauce to help cut down on some of the steps! Combine all the ingredients in a bowl and mix well. Cover and refrigerate, allowing the flavors to meld. Put pineapple, soy sauce, ginger, brown sugar, garlic, vinegar and sesame oil in a blender or food processor, and puree until smooth. Transfer to a medium saucepan, and warm over medium-high heat until bubbly, 1-2 minutes. In a small, separate bowl, whisk together the cornstarch and water until smooth then add to the saucepan, and stir until mixed. Heat the sauce, stirring constantly, until the mixture bubbles and thickens. Remove from the heat and set aside. Mix together the beef, yellow onion, garlic, salt, pepper and Worcestershire sauce. Form into 4 patties, each about ¾-inch thick. Cook the hamburgers directly over medium-high heat, turning once, 3 -5 minutes per side. Grill the buns if desired. The ridiculous amount I have piled on my second helping here should be a testament to how tasty this was. If you like gucamole, you need to try this. Corrie was cracking me up while eating…he’d look up every couple of minutes and say “this is really good.” So I was a very full and very happy camper. I will note, I probably got a little carried away with the quantity I put on my second helping here, you may want to start off with a touch (okay probably a lot) less if you’re a normal person. “Normal” has never been my strong suit. Combine the first five (garlic powder through onion powder) ingredients in a bowl, and then rub it all over the steak to coat. Using a grill on medium heat, cook the steak to medium rare – about 5 minutes per side – or medium (your preference). Remove from the heat and allow to rest for 10 minutes. Put the avocado, cilantro, garlic, red wine vinegar, olive oil, and salt in a food processor and process until smooth. If you’re not using the sauce immediately, refrigerate. The sauce makes these burgers, and it makes them quite delicious. I loved how easy it was to throw together…four ingredients anyone? Super easy, I’d definitely make these again! Combine mayonnaise, adobo sauce, lime juice, and cilantro in a small bowl. Cover it and chill in the fridge. Gently crumble beef into a bowl. Add the chipotle peppers, adobo sauce, grated onion, garlic powder, cumin, kosher salt, and pepper. Use clean hands to gently mix things together, only mixing until it is just combined, don’t over-mix. Divide into 4 patties (or 6 little ones) and place on a pre-heated grill, indoor grill pan, or skillet. 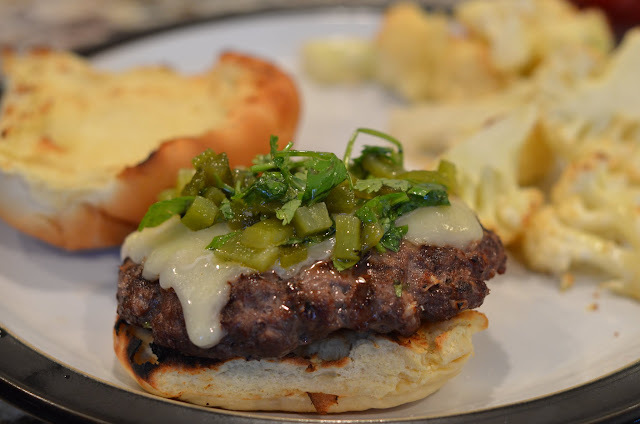 While the burgers are cooking, toast buns and spread chipotle-lime sauce generouslyon each side of each bun. When the burgers are done, let them rest for 5 minutes then top with avocado, tomato, and/or lettuce. The quest to get through the hamburger buns continued. These were a good, basic sloppy joe recipe, but I think next time I would up the ketchup and spices a bit to give it even more flavor. Brown ground beef with onion, green pepper, and garlic. Season to taste with seasoning salt. Add in mustard, ketchup, brown sugar, red wine vinegar, and Worcestershire sauce. Combine tomato paste and water and add to hamburger mixture. Add more water if desired. Season with freshly ground black pepper to taste. Cover, turn heat to low, and simmer for 30 minutes, stirring occasionally. Serve on hamburger buns. I had originally planned on making this with beef; however, I thought I had some in the freezer, and I didn’t so I used chicken instead. It was still delicious, so I think other than the fact that I’d like to try this with beef, I would also let the sauce reduce down even further to become even more syrupy since I’m a strange bird and that’s how I like it! Heat 2 teaspoons of vegetable oil in a medium saucepan over medium heat. Then add the ginger and garlic taking care to add the soy sauce and water before the garlic burns. Add the brown sugar and stir to dissolve. Raise heat slightly and boil the sauce for 2-3 minutes or until the sauce thickens. Remove it from the heat. I didn’t do this section….Slice the flank steak against the grain into 1/4″ thick bite-size slices. Tilt the blade of your knife at about a forty five degree angle to the top of the steak so that you get wider cuts. Dip the steak pieces into the cornstarch to apply a very thin dusting to both sides of each piece of beef. Let the beef sit for about 10 minutes so that the cornstarch sticks. Heat oil in a wok or large skillet until it just begins to ripple but isn’t smoking. Add the chicken/beef and cook on both sides until browned. Next add the onions (and broccoli if you didn’t steam it; otherwise add at the end until heated through) and sauté for 2-3 minutes. Pour the sauce in and cook until thickened to taste. Serve over rice if desired. Yum, yum, yum. I am an annoyingly picky person meat eater. Not when it came to this meal though, this recipe is definitely a winner. I loved the flavor, and although this is part of the old camera series, even the picture is making me want to make it again immediately. Best part…super easy to throw together ahead of time! Put all the ingredients in a gallon size food storage bag including the flank steak. Mush it around so that everything is evenly incorporated, and marinate in the refrigerator for 6 hours at the minimum or overnight. Grill the steak (or you could probably also cook it in the oven), and let rest for 10 minutes otherwise the juices will all run out when you slice it. Flank steak will be very tough if you don’t cut against the grain, so make sure to slice it against the grain into chunks or small pieces. Top with desired toppings and serve. I’m growing to like onions more and more, but since I altered the recipe to “stew” a little more in liquid and really take on the wine and vinegar flavor, they were almost sweet. Very delicious as a topping, and something I’m sure I’ll be making again. While pre-heating your grill, split the meat into quarters and shape into patties. This will produce smaller burgers, so if you want ‘normal’ sized burgers, either increase the meat or decrease the number of patties to three. Drizzle the burgers with the oil and season with salt and pepper. Put on the grill, and when the burgers have about a minute left, put the cheese on top of each burger and then close the grill cover to melt the cheese. Spread the butter on the cut sides of the buns and season with salt and pepper. Place the buttered side down on the grill, and grill until a light golden brown, about 30 seconds. Assemble the burgers spooning your desired amount of the jam on top of the burger. Heat the oil in a medium sauté pan over medium-low heat. When the oil is warm, add the onion. Stir occasionally until the onion is soft – this took me about 5-6 minutes, but could take longer depending on how ‘hot’ your medium-low is. Then add the wine, vinegar, honey, and thyme to the pan. Bring this to a simmer, stirring occasionally, until the liquid has evaporated, about 5 – 7 minutes. Season with salt and pepper, and remove from the heat to allow it to cool to room temperature. Jam can be made up to 2 days in advance and stored in the refrigerator in an airtight container. Bring to room temperature before serving.